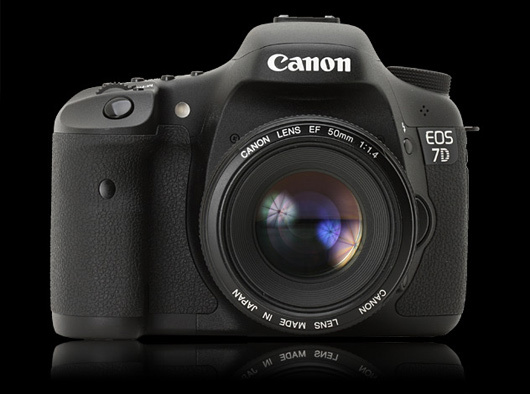 Flame war debate: Canon Unveils EOS 7D | Shelby White - The blog of artist, visual designer and entrepreneur Shelby White. Now, what do you think. Is this a camera that is fully worthy of a release at this point? Do you believe that Canon should have spent their time releasing or designing something else? If so, what and why? Note: I’ve started the debate by this comment earlier this morning. I made this comment earlier on the twitwebs. 2- Lighter & smaller = awesome! Looks pretty good to me. Fuel on the fire! Although I hate when canon under cuts there best cameras with a lower price point camera in all honestly this one is not so bad. Yes the sensor is 1.6x but for some people thats a plus think your 200mm on that baby. As of right now with a 1D Mrk II, I am fully satisfied with everything it has BUT it would be nice for commercial work or something where you need higher mp / resolution to have this lightweight body in the bag to grab. Also at that price tag, it will be hard to beat. The video again something extra but hey the price is not bad for all the functionality. This could be a great backup or 2nd shooter lightweight cam for me! PS. the new 19 AF points get my thumbs up even the 5d mrk ii doesnt have that it only had 15. and most are invisible! It would have been a smarter move on Canon’s part to introduce a 7d that had a better design as well as not a 1.6x factor. There currently is only one 1.3x camera in the line right now and that’s the 1d3. IF Canon would have done that, this camera would step into my FOV if you will. You’re throwing a popup flash on an 18mp, 8fps cam and trying to make it high-end? Seems like a half joke. All I know is that I’ll be picking it up. for $1700, it’s a huge upgrade from the 20d. The only bad thing to me is the 1.6, but you can work around that. It’d be nice to have a 5dmk2 and a 7d imo. trying to keep up with the jones’ can drive a photographer crazy. all of canons cameras are super powerful nowadays and it just seems like peas and carrots to me. until i can change custom functions on my 1dmk2n with my eyes closed, i’ll be happy with what i have. Here’s a great article from a photog who had access to a beta copy of the 7D – full res samples of all ISOs, plus video modes, and useful info about the AF system and new lenses. I’d rather see canon release a phone + high res camera with literally no options, now thats something I’d buy…but really, I agree with Sean in a sense that keeping up with the technology is hard. Taking a look at Rob Galbraith’s site and seeing how truly amazing noise is handled per ISO change is great. Been waiting to see what they were going to release next and am a tad shaken in either direction on this one. But, being the 2nd day of the news, we’ll have to see what they’re saying after a few more weeks of shooting with it. Loving the opportunity to work HD video again though. Wireless TTL, nice! Although there are dual processors I wasn’t expecting DIGIC IV for this new release. Seems like they could have let go of dual V’s in this baby, cuz you know they’re lingering somewhere in that Canon Lab! Also, judging from the various ISO shots on Rob’s site, the images to seem a tad noisy for a camera with this many changes. I could be wrong though. Either way, bring on the ISO 50’s and 25’s for all the slow shooters! I’m kind of disappointed it doesn’t have a cell phone built in. I think there becomes a point in technology for photography where you really can’t make the camera better. Unless that camera can actually make a three dimensional print that defies the laws of string theory. Other than making prints the size of a small country, how many mega pixels does one actually need? So I guess this is where breeding of still and motion cameras comes into play. And now that the technology has arrived, I’d like to be able to call my girlfriend while I’m shooting in some hot, exotic location… from my camera. The level on the camera seems like a great idea. I have no idea what I would use it for though. I suppose if I needed to level my Ikea shelves that need to be installed, I could use the 7D. Just seems to me they’ve created the highest and lowest end models and are just filling in the gaps with stuff like this now. Not that it’s bad by any means. It’ll certainly be interesting to see what comes up in the next few years. Can’t wait to get a 5DmkII. I was really excited when I first heard that Canon had released a new camera body, then when I saw the new 7D is was pretty disappointed. First of all, I thought the 50D was a mistake. Why release a camera with more mega-pixels just to have more mega-pixels? Especially when the camera before it (40D) outperforms it on noise levels. I think the 7D was an obvious response to the Nikon D300s. Maybe from here on out they will drop the line of the 50D. The new 7D to me is like the Nikon D80/ D90. I think its just a camera with a bunch of gimmicks. I for one am not a fan of the HD video shooting in camera bodies. I dont know anyone that uses that feature in their 5D Mii. I think this body will be good for wildlife photographers that want a crop factor and also weather sealing in their camera bodies. But why create another class of camera? Now there is another go between class to get to the 1D/1Ds bodies. I don’t see why they want to keep people from buying their most expensive bodies by making people think the 5D is the best camera available. No 5 exposure bracketing and no iso 50 = sad face.